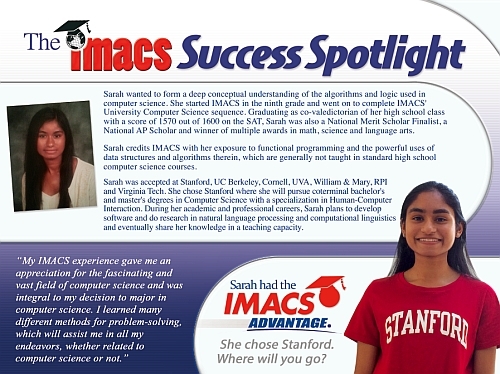 Congratulations to IMACS graduate Sarah Thomas who will attend Stanford this fall. Sarah wanted to form a deep conceptual understanding of the algorithms and logic used in computer science. She started IMACS in the ninth grade and went on to complete IMACS’ University Computer Science sequence. Graduating as co-valedictorian of her high school class with a score of 1570 out of 1600 on the SAT, Sarah was also a National Merit Scholar Finalist, a National AP Scholar and winner of multiple awards in math, science and language arts. Sarah was accepted at Stanford, UC Berkeley, Cornell, UVA, William & Mary, RPI and Virginia Tech. She chose Stanford where she will pursue coterminal bachelor’s and master’s degrees in Computer Science with a specialization in Human-Computer Interaction. During her academic and professional careers, Sarah plans to develop software and do research in natural language processing and computational linguistics and eventually share her knowledge in a teaching capacity. Congratulations to IMACS graduate Rachel Gologorsky who will attend Harvard this fall. Rachel began attending IMACS as a first grader. Homeschooled since third grade, she has always made time for IMACS in a busy schedule that revolved around competitive chess. While rising to the rank of #1 player in the US and #15 player in the world among girls under 14 and later attaining the title of Woman FIDE Master at just 16 years old, Rachel completed IMACS’ Advanced Math Enrichment and university-level courses in Computer Science and Logic for Mathematics. As a high school student, Rachel earned A’s in multiple undergraduate math, science and computer science courses taken at Carnegie Mellon. She also scored a perfect 2400 on the SAT on her first attempt and earned 5’s on all of her Advanced Placement exams, including Computer Science A, Calculus BC, Statistics and Physics C.